Inspired by the earliest and core texts of Zen Buddhism, Zen Speaks distills the philosophy and wisdom of Zen in a series of illustrated Chinese character cartoon panels that are irreverently humorous and profoundly wise. the earliest and core texts of Zen Buddhism, <i>Zen Speaks</i> distills the philosophy and wisdom of Zen in a series of illustrated Chinese character cartoon panels that are irreverently humorous and profoundly wise. Zen Speaks is a staple for our family conversation, with comics often providing the perfect zen philosophical teaching for a moment, decision or situation. 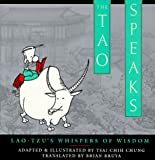 Accessible, deep and good for beginning to share Zen Philosophy with the whole family, but I used it for years before we had kids. 5.0 out of 5 starsZen for the rest of us. I saw the chinese version of these when I was a kid and always thought they looked neat but I dont read chinese.. nice to see it in english and its a great way to spend some time, love the art, mad accessible. Excellent books. Thank you very much. I bought a few of them to share and your books were in the best condition. Zen Speaks is another book that can easily be read when a person has a few minutes to spare. The book shares some powerful Zen proverbs/lessons in the form of a illustrated stories. Each story is introduced by a recurring character, the fellow depicted on the cover, and then the story itself uses actual Chinese historical figures to convey a message. The message is then summarized in a blurb so that anyone not understanding the message in story form can still grasp the underlying ideas. This is a great book to help grasp the un-graspable. This book exists to make Zen more accessible to the general public. For those people that practice Zen, the essence of Zen can only be felt or only be understood but not through words or pictures. As one teaching of Zen would have it, you would appreciate how beautiful the moon is rather than the finger that points you to that moon. I have to admit that this book manages to clarify certain teachings that are also mentioned in other Zen books. I'm not saying that this comic book provides me with the absolute truth about certain Zen sayings but it does provide me with an insight. Everyone has their own ways of getting to the original thinking & if this book cuts the cake, so be it. If we think that this is merely a comic book, then, it is a delusion! Remember, don't judge a book by its cover. This book is profoundly serious. Highly recommended, light-hearted & enjoyable to read. Truthfully, I don't know how well this book introduces Zen, but I do know that I really enjoyed it. All the Zen stories that I've heard over the years plus tons more are all presented here in cartoon form with short explanations by someone (a cartoon zen master I presume) who is explaining the story to a westerner. One point that I have to make is how much more of an impact this book had on me after I watched Joseph Campbell's video series "The Power of Myth" . I read this book both before and after I watched the videos and realized how much more they meant to me afterwards and how great this book really is. If you want to get even more out of this book, check out the Campbell videos, you won't be sorry that you did. Hard to imagine that a cartoon could unfold the depths of Zen. Perhaps it is the fact the cartoons are brief yet encapsulate so much. Personally, I find it to be in the expressions of the characters in the drawings that tell the story. I really feel the smiles throughout the book and can almost see them winking along with that smile. Never straying from the seriousness of Zen, this little gem really reveals the joy that lies underneath. A great way to get started; a great little reminder for those already underway. Elegant in simplicity. Zen in its humor. Tsai Chih Chung is brilliant in his ability to encapsulate the meaning and experience of these zen tales. You'll put this book down different than when you started. More a piece. Calm. Buddhist monk Tsai Chih Chung has made an incredible contribution to stacks of zen litterature with these witty cartoons. I've yet to find zen stories presented in an accessable and poignant manner as done here.